After Jaimee’s interview in KUOW and our feature in Real Change, we’ve been (pleasantly) overwhelmed with the submissions y’all sent it. Now, the Ghosts of Seattle Past team is back to announce the latest chance to share stories of lost Seattle places. We’re partnering up with the Center for Architecture and Design as part of their BOOM! exhibit opening July 7th at 5 p.m. Jon, Josh, and Jaimee are so excited to share the project so far with Seattle residents like you (you! reading this!) who make Ghosts of Seattle Past not only possible but crucial. If you’ve heard the team’s voices, seen their handiwork, or just gotten inspired by the stories they’re telling, now’s your chance to meet them. You can RSVP for this very special First Thursday here. The subtitle to the BOOM! exhibit is “Changing Seattle.” The Center for Architecture and Design wants to bring artists, researchers, landscape-shapers and residents together to think through Seattle’s growth spurts. What places did we lose? What were we chasing after? What have we managed to preserve? The exhibit focuses on four neighborhoods: Ballard, the Central District, South Lake Union, and SODO. Our team will be exhibiting alongside the likes of the brilliant C Davida Ingram, Seattle in Progress, No Touching Ground, and Rodrigo Valenzuela. We’re psyched to premier pieces alongside new video work by Paul Komada and Inye Wokoma, and the FIRST EXHIBITION EVER of the Invisible Seattle archive. The Center for Architecture and Design. Photo Credit: Michael Cole Photography. Above you can see the CAD as it currently is. Along with our co-exhibitors, we’ll be completely transforming it. Visiting our part of the exhibit will be like going inside the anthology—the CAD is pulling some of their favorite quotes from some of their favorite pieces and splashing them up on the walls. 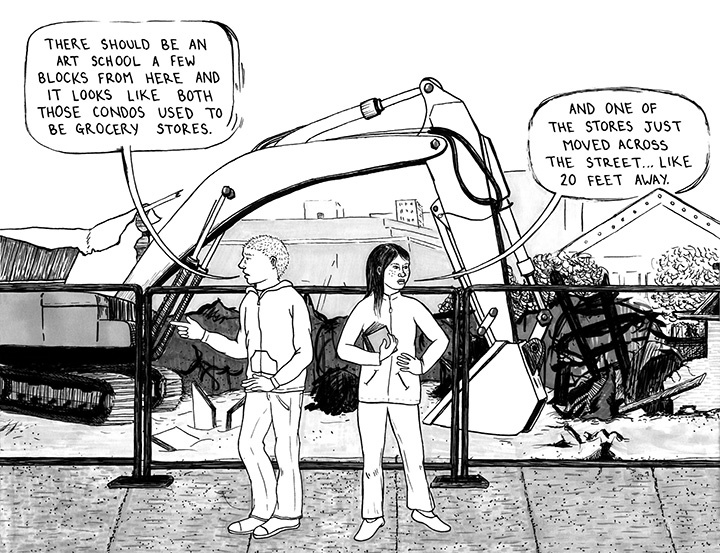 And did any of you see Eroyn Franklin’s panoramic comic “The Here”? The section below is only a taste. We’ll be blowing up this panoramic comic. It’s a joyride in perspective and we are BLOWING IT UP to wrap around several walls in the space. 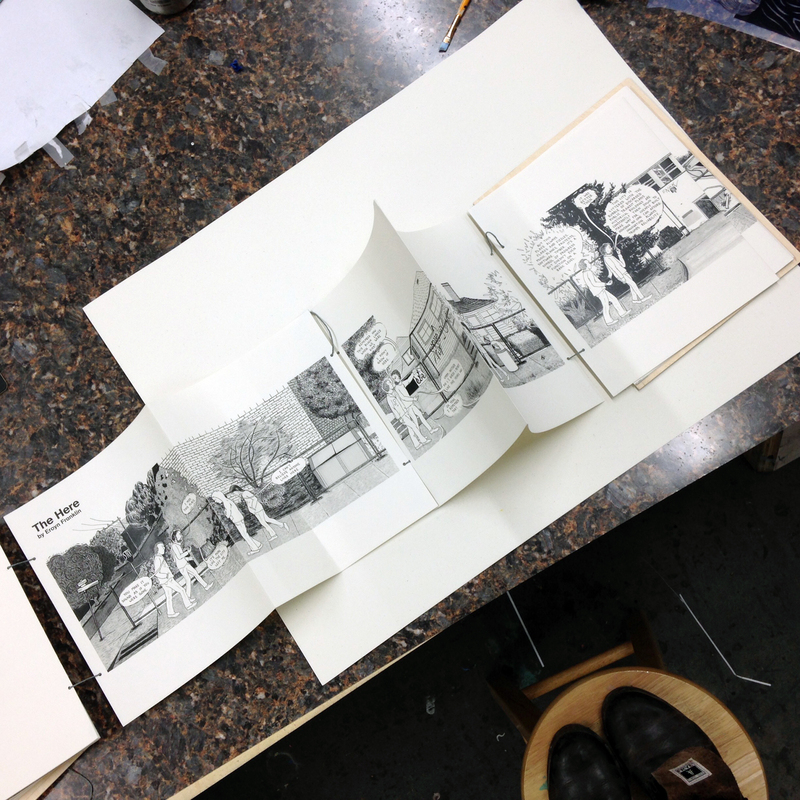 Want to see the piece in its original fold-out form? You and twelve of your closest friends will be able to read it (and plenty of other pieces) in a brand-spanking-new Beta 2.0 version of the anthology. Why so many readers? Because like the first version, the entries in this anthology will be bound on a couple of long pieces of twine. Excited readers can stretch the book across a whole table and take in, for instance, Kate Lebo’s piece on the Sunset Bowl in Ballard while the person next to you reads Dave Holden’s memories of the Black & Tan and Palomar in the old CD. They’ll be pen-and-ink renditions from Ghosts’ very own Josh Powell, and darn close to final. The locations that are tagged so far won’t be labeled on these displays BUT we’ll have a laptop installed where you’ll be able to pin your lost places to our digital map. Your additions will later be added to the hand-drawn maps, incorporated into the traveling exhibit, and eventually featured in the Anthology! We’ll also have a living, breathing element to the installation: instigator/curator/editor Jaimee Garbacik and contributing artist/interviewer/team member Shelly Leavens will be at the CAD to listen to your stories. Date TBD, so keep an eye on this blog and the Ghosts of Seattle Past Facebook and Twitter for more news. 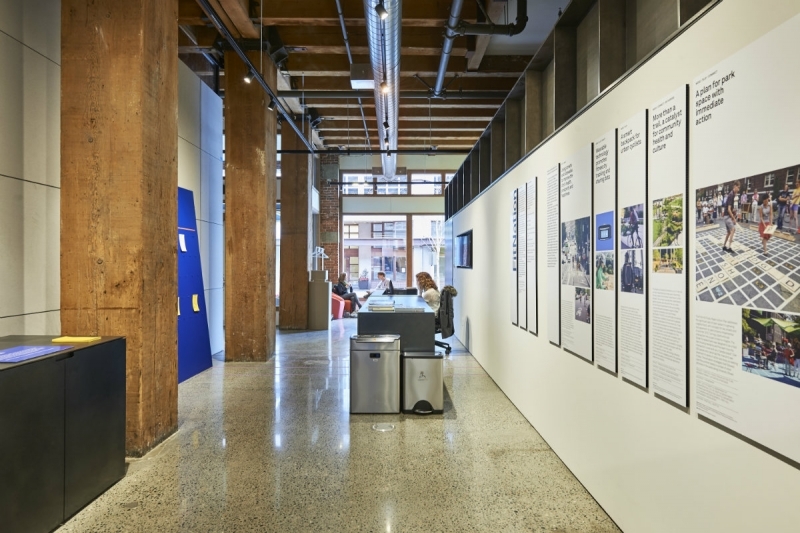 The Center for Architecture and Design is located at 1010 Western Ave, Seattle, WA 98104, and is free and open to the public Tuesday through Friday 10 a.m. to 6 p.m., as well as Saturday 1 p.m. to 5 p.m. The BOOM! Exhibit will be running from July 7th to August 29th. Previous post: It’s the Irish Wake Recap You’ve All Been Waiting For!